When you think about Crossover cars, what goes through your mind? Is it a car? Is it an SUV? Yes. It's both. If you are searching for a crossover for sale We here at Acra Auto have crossovers in stock. If you want a smaller type of crossover we have several Kia Soul, and also Volkswagen and Honda Crossovers. Have you been to other Greensburg dealerships and left empty-handed and disappointed? We here at Acra Auto know that the car buying process can be frustrating, time-consuming and disappointing unless you find the right dealership who wants to help you get the car you want. A crossover is a unique vehicle since it gives you the look of a car and an SUV, it has a sporty appeal, is practical and has all the features that a car or SUV has with a unique, eye-catching appeal that other cars and SUVs don't have. If you are in the market for a crossover for sale near you, we want you to come by our dealership and take a look at what we have in stock, ask questions, take a test drive and see if a crossover is a right choice for you. 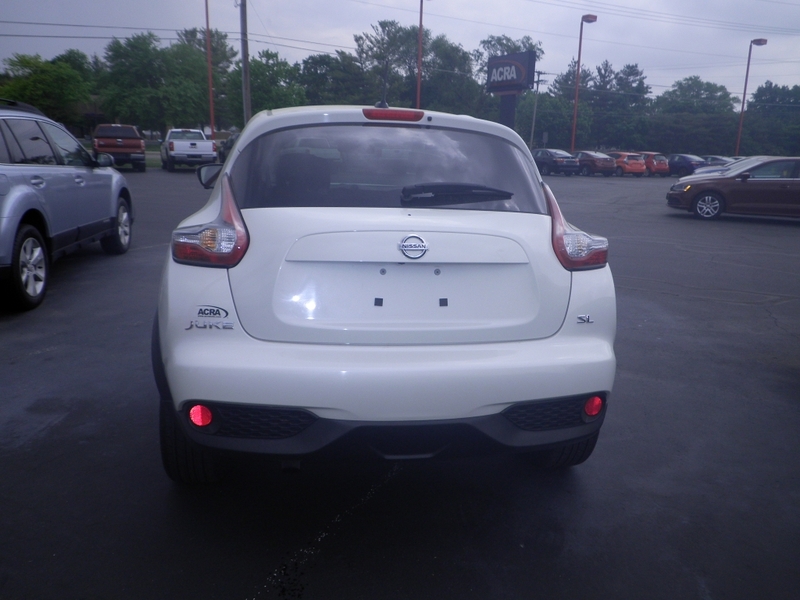 We have at our dealership a 2015 Nissan Juke is an impressive crossover car with a very flattering body style. This Nissan Juke would be a good find for someone who is looking for something different, something that stands out on the road. If you are a college student, this car would be a good choice for you, also if you want something that is different from the rest. The features on this Nissan starting with the outside is a White Pearl exterior, with a Black leather interior. 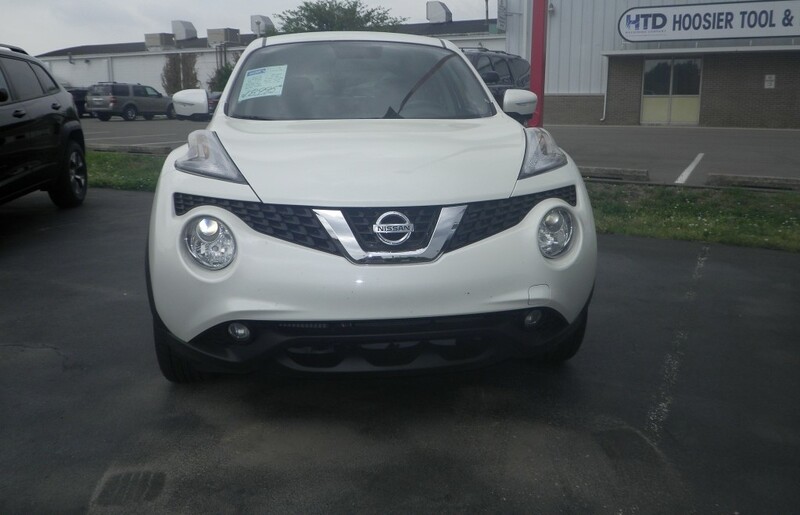 This Nissan Juke comes with 4 doors, has front wheel drive, a 4cyl, 1.6L, 188hp turbocharged engine and has Transmission W/Driver Selectable Mode. Some beautiful features equipped on this Nissan are a tilt/sliding sunroof, heated leather seats, navigation, Bluetooth capability, cruise control, and steering wheel controls. It comes with a backup camera, satellite radio, AM/FM Stereo, a CD Player, MP3 Compatible, and it has keyless entry, keyless start, power windows, power locks, power mirrors, integrated turn signal mirrors, Premium Rockford Fosgate System. Don't want a crossover? No problem, we can help you find what you want in a used SUV for sale, or car, minivan, or maybe even a truck. Our friendly staff here at Acra Auto want you, our customer, to be happy with your car searching and buying experience. We want you to feel like family when you come to our dealership, and we want you to leave satisfied and in the car of your dreams. Please stop by our dealership if you are in the market for crossovers for sale in Indiana. Don't waste your valuable time searching endlessly for that perfect car for you. We are guaranteed to have what you are looking for and are here to help you in any way that we can so that you are driving away pleased with your car buying experience. We are Acra Auto located at 1407 North Lincoln Street Greensburg, IN.